One would be forgiven for thinking that the horrific attacks in Chapel Hill this week, in what very much looks like a hate crime, would attract the same level of media coverage as any other attacks of such a nature. But this hasn’t been the case. While the media have been slow getting off the mark, unlike the media frenzy that took place in the aftermath of the Charlie Hebdo attacks last month, it’s worth noting that at the time of writing, President Obama has issued no official statement on the murder of the three innocent young Muslims. It’s telling to note, the issues on which politicians choose to speak out on. And we can also tell a lot from the mainstream media. The stories which are often amplified, when compared with the stories which receive little or no coverage, reflect the agenda which is really being served. Three young, innocent Muslims were slain in what can surely be described uncontroversially as a hate attack. But it is politics, the narrative from on high, not honesty and common sense which has led to the refusal of the media and police to acknowledge the murders as such. According to the family of the victims however, the alleged killer who has now been charged with murder, had been harassing the family for some time. If the dynamics of this tragedy were any different, if the victims were not Muslims, you can bet that the atrocity in North Carolina would have received widespread coverage. Had the killer himself been Muslim, and the victims white, the killings in Chapel Hill would probably have been categorized as a terrorist attack. European leaders would right now be talking about the threat to our domestic freedom, evoking an inevitable end of day’s scenario pitting the civilized West against the barbaric East in order to justify their own forms of domestic and exported terrorism. As it stands, many people haveprotested and expressed their indignation at the media’s reaction to the tragedy in Chapel Hill. But the victims in this case are Muslim, and so the story has been much less milked for all its political worth as was cynically done by war criminals marching through Paris in the name of ‘free speech’ after the Charlie Hebdo attacks. The overall narrative of the mainstream media cannot accommodate any semblance of reality which heaven forbid suggests that Muslims are human beings-who are the often the victims of terrorism, and rarely the torch-bearers of it. The media’s silence in the wake of the Chapel Hill shootings however, reflects the fact that the media is Islamophobic serving only powerful interests. To this end, Muslims must be portrayed as subhuman in order for the crimes being committed against them to seem justified. And this is the point: The three young people murdered in Chapel Hill are not unique in the lack of coverage their brutal executions warranted. The routine bombings of Muslim countries leading to the death of countless innocent Muslims are ignored at best by the mainstream media and utterly distorted at worst. If the mainstream media regularly ignores the butchering of Muslims on the one hand, on the other, it justifies their genocide and lands are being invaded, which happen not for humanitarian reasons, but for the theft and looting of wealth. Many Muslim lands are rich with resources and so a pretext is needed to justify stealing those resources and to justify the genocide needed to carry out such aggression, robbery and murder. It’s very basic psychology, the aggressor shifting blame to the victim. And this prejudice isn’t simply confined to the media. According to the American-Arab Anti Discrimination Committee, films like the recent blockbuster ‘American Sniper’ fuel the dangerous anti-Islamic sentiment which has been on the rise, and which has seen attacks on Muslims spike since the Charlie Hebdo attacks. History repeats itself. During the African holocaust, Africans were demonized in order to justify slavery. During the Jewish holocaust Jews were portrayed as less than human in order to justify their mass murders in concentration camps. Since 9/11 we have seen, and are seeing the murder of Muslims, genocide in countless countries, in order to steal natural wealth and resources. We are subject to the inevitable brainwashing and propaganda that is relentlessly plugged into people’s minds to make them believe that Muslims need to be invaded and occupied in order to save them from the pitfalls of their backwards mysticism. This narrative has no room to dwell on the killing of three innocent young Muslims, who were also American, and who fed the homeless in their spare time. The other striking aspect to the portrayal of the tragedy in Chapel Hill is that so far the alleged killer is being presented as mentally ill, the lone wolf, rather than a fanatic with a hateful ideology, despite his history. It seems that the media go to great lengths, trip over themselves in fact, to ignore the skin color or ideology of a killer-unless they are brown or Muslim. Then of course, the crime becomes everything to do with religion and culture, and nothing to do with the mental state of the perpetrator. This is a destructive and malicious paradigm peddled by the mainstream media. The reality is that hate crimes against Muslims have spiked since the Charlie Hebdo attacks. Muslims are victims of terrorism, be it at the hands of ISIS or the Israeli government, in overwhelming numbers globally. It’s a surreal time to live in when this is the state of play, off the back of how many illegal wars and drone attacks on Muslim countries, and yet far from acknowledging this fact, ordinary Muslims find themselves being asked to apologize for something they had nothing to do with. And of course, the elephant in the room which is never addressed by the media is the fact that these attacks are a result of aggressive foreign policy. The liberal media like to pretend that all those being radicalized are being radicalized because they hate our freedom, miniskirts, democracy and general way of life. It has nothing to do, should anyone ever have the audacity to suggest it, with Muslim lands being constantly decimated and butchered by drone attacks. 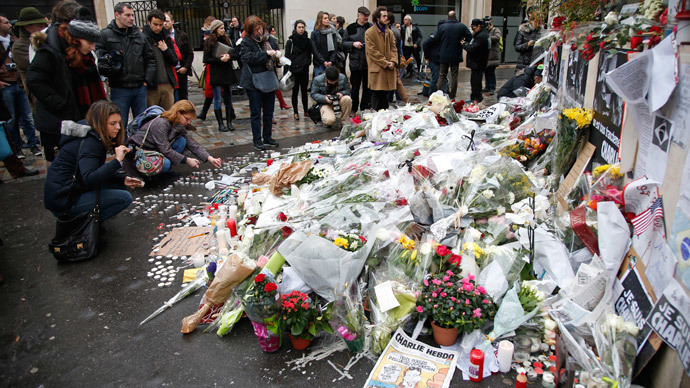 The Charlie Hebdo attacks were focused on because they could be used for political purposes. The political motives for the attacks themselves however were ignored as they always are. Religion is to blame we are told, and ideology, not Western foreign policy. Ultimately, whichever way we view things, the answer to who was responsible for creating the climate for the Charlie Hebdo attacks can be seen in who benefits: leaders and war criminals pushing though their terror laws, and parading though Paris, in the name of freedom. In Chapel Hill, that the killer was a white male atheist with an extreme ideology, and the victims were Muslim, so the story is barely newsworthy because it is not conducive to the real story which is being sold. Where is the outpouring of grief for the victims in North Carolina? Where are all the atheists being asked to apologize for not doing more to root out an ideological extremist from within their collective community? February 15, 2015 in Chapel Hill.